Added updates for Sunday April 18 2010 at the bottom. Also there are useful links for air travelers and train travelers. Volcano Eruption in Eyjafjallajökull Iceland April 14 2010: Photo taken by a man named Ólafur Eggertsson from the farm Þorvaldseyri. April 14, 2010 — The 2nd Eyjafjallajökull volcano eruption in south Iceland for year 2010. It started on 14.04.2010. GPS coordinates of the eruption: 63.629° N, 19.630° W. Video by Icelandic National TV stations RÚV and Stöð 2. Music by Jonn Serrie, The Legacy, Spirit Keepers. Date: 14.04.2010. March 21, 2010 — Video made by the Icelandic coast guard of the volcano eruption near Eyjafjallajökull glacier, in South Iceland. The eruption started shortly before midnight on Saturday 20th of March 2010. According to meteorologist Thorsteinn Jónsson at the Icelandic Meteorological Office, the ash emitted from the volcano in Eyjafjallajökull in south Iceland will continue to drift across Europe and spread to many countries in the next 24 hours. Scandinavia, the British Isles, the Benelux countries and even Poland will be subject to ash fall in the next 24 hours, Jónsson told ruv.is. He finds it likely that the eruption will continue at the same force and that ash can spread as widely as across the entire northern hemisphere. In Iceland the Eyjafjallajökull eruption has caused extensive ash fall in the regions east of the glacier today. The situation was worst in the eastern Mýrdalssandur sand plain and in the Medalland and Álftaver districts in Skaftártungur. Ash fall was also reported in Kirkjubaejarklaustur and as far as Höfn. Tomorrow wind is forecast to blow in from the north and then ash is expected to spread over the districts south of Eyjafjallajökull and to the Westman Islands. Forecasts also assume that ash will continue to drift with upper atmosphere winds in the coming days. 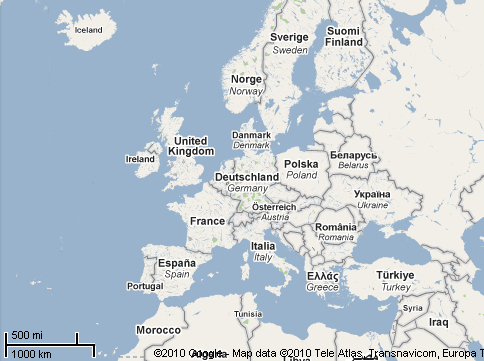 Airports have been closed in Scandinavia and the British Isles today and millions of travelers are stranded. The British media has stated that never before in peace times has aviation been brought to such a standstill in the UK—after the 2001 terrorist attacks there were still flights to a few destinations while the current ash fall is causing an absolute flying ban. There has not been as much volcanic ash falling in Iceland since the Katla eruption of 1918 and that eruption caused many farmers’ entire stock of animals to die. Vilhjalmur Eyjolfsson from the farm Hnausi to the east of Eyjafjallajokull told RUV the ash cloud is darkening the sky and the ash is still falling. He says he has never seen anything like it. If the situation lasts long, he fears there could be trouble with regard to putting his animals out to graze, as they must be protected from eating or drinking volcanic ash at all costs. Eyjolfsson said his farm experienced ash falls from the Grimsvotn eruption in 1934, but today is much worse. All farm animals in the Medallandi area died when Katla erupted in 1918 and Eyjolfsson says people took many years to get over it. There is considerable ash fall resulting from the volcanic eruption under the Eyjafjallajökull glacier. The ash that is falling is composed of both fine and course particles. The wind direction and other meteorological conditions have an impact on where the ash falls to earth. An examination of the ash particles is in progress but it is known that the ash originated from the volcano and so it can contain the chemical Florine, which is a pollutant and can have harmful short term and long term effects for grazing animals. People with pre-existing chest complaints may develop severe bronchitis symptoms which last some days beyond exposure to ash (for example, hacking cough, production of sputum, wheezing, or shortness of breath). Eye irritation is a common health effect as pieces of grit can cause painful scratches in the front of the eye and conjunctivitis. Contact lens wearers need to be especially ware of this problem. Acute conjunctivitis or inflammation due to the presence of ash, which leads to redness, burning of the eyes, and photosensitivity. Use a mask when outside, and it is also recommended to wear protective clothing. If a mask is not available the use a cloth over the mouth and nose to prevent inhalation of larger particles. Children and adult with respiratory problems should remain indoors. The unprecedented closure of airspace across Britain and large parts of Northern Europe is set to continue into the weekend, after a volcanic eruption in Iceland sent a massive plume of ash into the atmosphere. The giant plume also shut airspace in Scandinavia, Germany, Belgium, France and Ireland yesterday. More Airports could be affected depending on how far the Fall of ash travels. Norway, Sweden and Finland are also among European countries that have also been hit. It is amazing how the ash can travel so far in just one day. It goes with the wind. As I was looking at this map it occurred to me Radiation from Nuclear Bombs and DU can travel even farther as it is lighter, but invisible to the eye. (Reuters) – A volcanic eruption in Iceland, which has thrown up a 6-km (3.7 mile) high plume of ash and disrupted air traffic across northern Europe, has grown more intense, an expert said on Thursday. “The seismographs are showing that since this morning the intensity of the eruption seems to be growing,” he said. To the east of the volcano, thousands of hectares of land are covered by a thick layer of ash while a cloud blotted out the sun in some areas along the southern coast of Iceland, local media reported. The cloud of ash from the eruption has hit air travel all over northern Europe, with flights grounded or diverted due to the risk of engine damage from sucking in particles of ash from the volcanic cloud. Scientists picked up the first signs of increased seismic activity at Eyjafjallajokull last summer and had been expecting an eruption at any moment, Einarsson said. The eruption began in March but subsided earlier this week when a magma conduit became blocked, building up pressure which finally escaped through the volcano’s main crater. Einarsson, who described the eruption as “reasonably powerful,” said it was the most significant volcanic event in Iceland since a huge eruption in 1996, when an eruption under the Grimsvotn lakes led to widespread flooding. He said scientists were still concerned the ongoing eruption could trigger Mt Katla, a more powerful volcano nearby covered by a thicker ice sheet, but had not picked up any clear signs of brewing activity. The volcano under the Ejfjallajokull glacier, Iceland’s fifth largest glacier, has erupted five times since Iceland was settled in the ninth century. Iceland sits on a volcanic hotspot in the Mid-Atlantic Ridge and has relatively frequent eruptions, although most occur in sparsely populated areas and pose little danger to people or property. 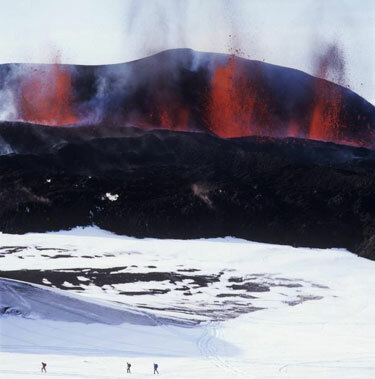 Before March, the last eruption took place in 2004. Warning. I was just checking for updates and noticed. Some News articles are saying that the Falling Ash/particles or whatever you want to call it, will not affect your health. That is not true. It most certainly can harm your health. If the ash is falling stay indoors if possible or wear a mask, especially those with respiratory aliments like Asthma. My Advice become an Atheist real quick. Don’t let them rip you off. Act of God my foot. That is just a line they use to rip people off. They can’t prove God did it. Nobody can. Ryanair boss Michael O’Leary tonight announced blanket weekend flight cancellations over safety fears for planes flying in northern Europe. The budget carrier’s chief said all services to and from the UK and Ireland and about a dozen other regions have been grounded until 1pm on Monday. Mr O’Leary apologised to customers but said he was acting on advice that stable weather was continuing to push potentially dangerous volcanic ash over the region. Some 17,000 flights in European airspace are likely to be cancelled Friday due to the dangers posed by a volcanic ash cloud spreading from Iceland, with experts warning that the disruption could continue into the weekend. Although some Scottish and Scandinavian airports are likely to resume limited flights Friday, a ban on flights still covers most UK airspace and much of Northern Europe. Eurostar has also confirmed that it has no availability for trains on Friday, April 16. Flightstats tracks aviation delays worldwide, showing the current status of individual airports and flights. NATS controls all air traffic over the British Isles and the eastern North Atlantic and has provided regular updates on its website. Eurocontrol is responsible for air traffic across mainland European airspace and has provided regular updates on its website and on Twitter. 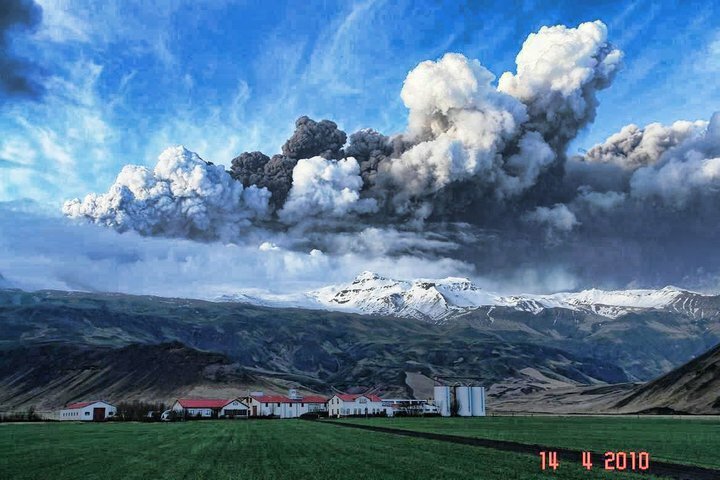 The volcanic eruption in the glacier Eyjafjallajokull in South Iceland is continuing but Icelandic civil protection authorities have the situation as regards public response fully under control. The affected areas have been evacuated and damage has been limited to roads, bridges and other infrastructure that has been destroyed by flooding. Further damage to agricultural land is evident. Day to day business in Iceland apart from the directly affected areas in the south has not been affected. The ash hurled into the atmosphere by the eruption has however caused serious disruption of air traffic. Icelandic scientists and public authorities, the Meterological Institution (http://en.vedur.is/) and the Icelandic Civil Aviation Administration (http://www.isavia.is/), remain in close contact with their counterparts in Europe in order to monitor the eruption, the weather conditions and the projected path of the volcanic ash cloud. Foreign visitors in Iceland that have had their flights cancelled are advised to contact their travel agents. Visitors coming to Iceland are encouraged to monitor the news and learn about their rights if the flight is cancelled. Travelers are also urged to take all necessary general precautions while travelling in Iceland and seek the advise of local authorities. Ash fall from the volcanic eruption in Eyjafjallajökull has affected air traffic in North Europe the last few days and therefore traveling to and from Iceland. People are encouraged to monitor the news and learn about their rights if the flight is canceled. All of Europe’s three biggest airports – London Heathrow, Paris-Charles de Gaulle and Frankfurt – were closed by the ash, which is a threat to jet engines and pilot visibility. Eurocontrol, the European air traffic control group, said only 11,000 of the daily 28,000 flights in the affected zone would take off Friday. It said at least half of the 600 daily flights between Europe and North America would be cancelled. About 6,000 flights to and within Europe were canceled Thursday. Poland, Britain, Austria, the Czech Republic, Denmark, Lithuania, Latvia, Estonia, Belgium and the Netherlands shut down all or most of their airspace. Finland, France, Germany, Russia and Spain experienced major disruption, although Sweden began gradually reopening airspace and Norway temporarily opened up some of its. 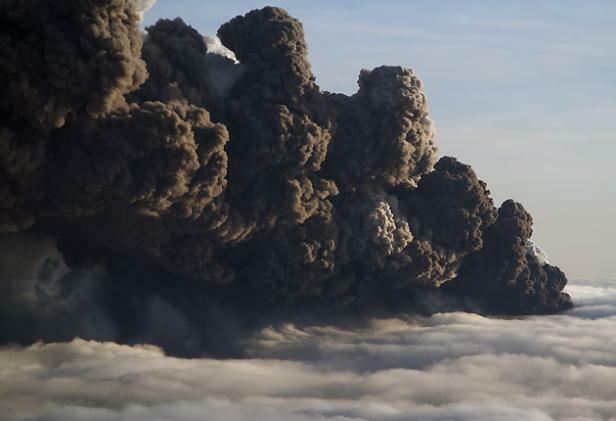 “Forecasts suggest that the cloud of volcanic ash is continuing to move east and southeast and that the impact will continue for at least the next 24 hours,” Eurocontrol said in a statement. Most aviation authorities promised a review on Friday, but the Dutch transport inspectorate set the uncertain tone: no flights “until further notice”. The prevailing winds, however, allowed Icelandic airports to remain open. This is from the Volcano that erupted in March 20 2010. There are three people walking at the bottom of the picture. This give us an idea of just how huge the volcano is. The eruption on Fimmvörduháls, which has now come to an end. Photo by Páll Stefánsson. Both eruptions are extremely close to each other. 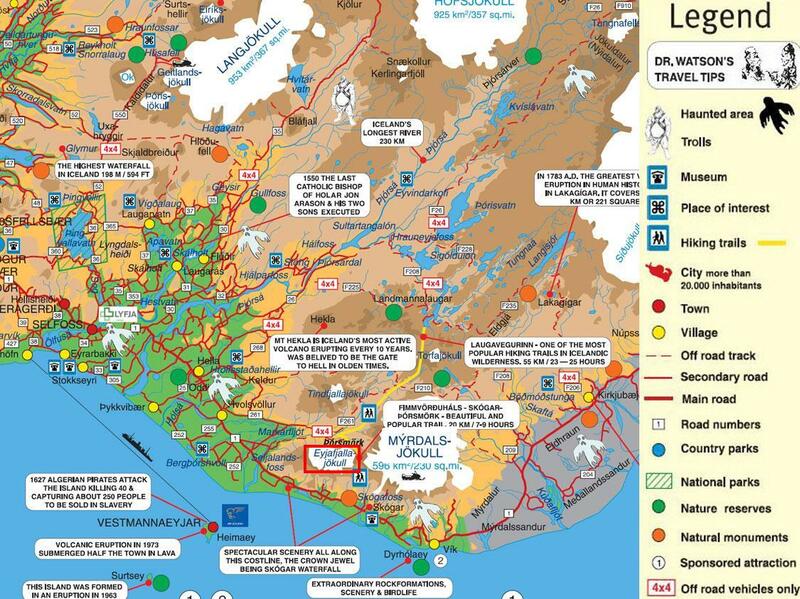 For more information Volcanic eruption, flooding etc. try this Link it is a google translated version to english. If that doesn’t work try this One it is the original and use your own translator. The videos below are under the world “Upptökur” Just in case the translated version below for the videos does not wok for you. Watch these videos shot from a car driving into the volcanic ash cloud in south Iceland from Drangshlíd by Skógafoss waterfall towards Skógar. There were 18 kilometers of absolute darkness but on both sides of the ash cloud the sun was shining brightly. Iceland volcano coming to an end? A University of Iceland geophysicist says there are now clear signs that the Eyjafjallajokull volcano, which began erupting on Wednesday, is slowing down. Attention is now turning to the more violent Katla volcano which many fear will erupt next. However, there are no indications that Katla is reawakening at the moment. AFP reports Sigrun Hreinsdottir, a geophysicist with the University of Iceland, as saying that the lava flow has slowed and that the whole eruption could now slow dramatically as a result. Hreinsdottir says it appears the lava is flowing from a lava chamber one kilometre deep. She likens the lava chamber to a bursting balloon, adding that nobody knows how much lava is inside in order to accurately predict when the eruption will stop fully. The pressurised lava always tries to find the easiest way out, she says. That was at Fimmvorduhals in March and is now at the top of Eyjafjallajokull. The build-up of pressure when this eruption finishes will lead eventually to another volcano erupting. History teaches that Katla may well be next, but whether that will be tomorrow, in one year, or never, is impossible to say today. Katla last erupted in 1918. The Iceland’s volcano has spewed about 140 million cubic metres of ash over the past three days, Icelandic scientists have said. Many flights are still canceled. 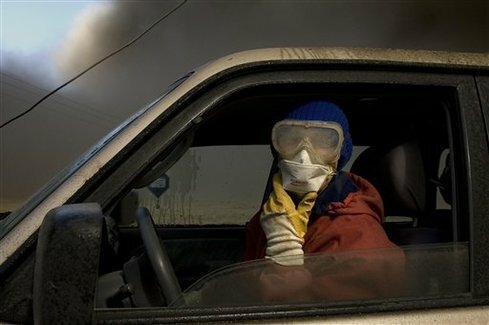 Some until Tuesday..
AP Photo – Wearing a mask and glasses against the smoke, dairy farmer Berglind Hilmarsdottir from Nupur, Iceland, looks for cattle lost in ash clouds, Saturday, April 17, 2010. The volcano in southern Iceland’s Eyjafjallajokull glacier continued to send ash into the air Sunday. “The risk is of fluoride poisoning if they breathe or eat too much,” Hilmarsdottir said through a white protective mask. The fluoride in the ash creates acid in the animals’ stomachs, corroding the intestines and causing hemorrhages. It also binds with calcium in the blood stream, and after heavy exposure over a period of days makes bones frail, even causing teeth to crumble. 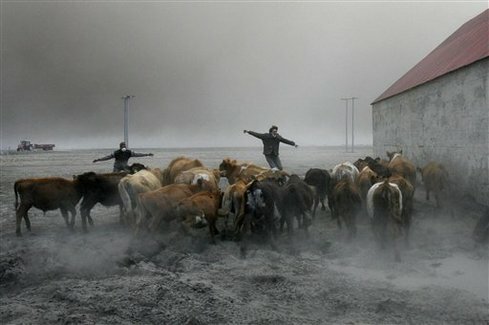 AP Photo – Farmers team up to rescue cattle from exposure to the toxic volcanic ash at a farm in Nupur, Iceland, as the volcano in southern Iceland’s Eyjafjallajokull glacier sends ash into the air Saturday, April 17, 2010. The enormous shroud of fine mineral dust particles now stretches from the Arctic Circle in the north to the French Mediterranean coast in the south, and from Spain into Russia. US violates UN law by threatening Iran with Nuclear strike.